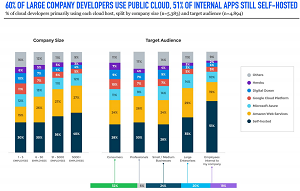 A new developer survey published by VisionMobile Ltd. examines the cloud computing space, finding that while Amazon Web Services Inc. (AWS) is the preferred public cloud platform across all customer and industry segments, it's somewhat challenged by competitors in certain areas. The new "The State of the Developer Nation Q1 2017" report, based on VisionMobile's 12th Developer Economics survey, presents insights based on polling more than 21,200 developers in 162 nations around the globe. One section of the report examines "challengers chasing the cloud prize" and reiterates the dominance of AWS in the cloud space, helped by Amazon's policy of re-investing profits from existing businesses in order to expand operations and create new businesses. While that policy paid off in growing segments like AWS, it resulted in small profits until recently. "Their creation of the public cloud market is now paying off to such a degree they can't spend the profits fast enough," the report said of Amazon. "For several years now others have recognized the size of the prize that Amazon is chasing and raced to catch up so they could compete for a share of it." Remarkably, AWS's growth and profitability have occurred in the midst of price wars among cloud providers. Among those competitors, the report said, only the Microsoft Azure cloud and the Google Cloud Platform can be considered as serious challengers, and then only in certain areas. "Amazon Web Services (AWS) is the most popular primary cloud hosting at every company size," the report said. "For the smallest companies (1-5 employees) where Amazon has just a 15 percent share, they face very credible competition from Microsoft (12 percent), Google (11 percent), and Digital Ocean (10 percent). However, when we look at larger companies, Amazon's share grows to 26-27 percent at every size, Microsoft stays in the 11-13 percent range, while Google fades along with Digital Ocean. Google has just a 5 percent share of companies with more than 5,000 employees, and Digital Ocean just 4 percent at the same size." Similar dominance is exhibited in the all-important race for developer mindshare. 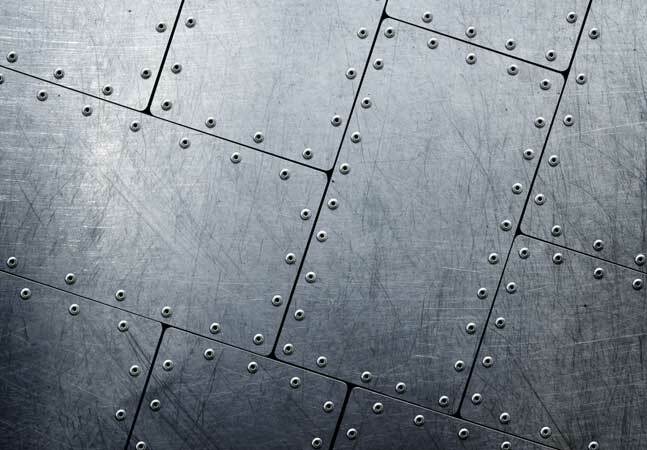 "AWS is also the most popular primary cloud host with developers regardless of targeted audience, although strongest with backend developers who target large enterprises, of whom 29 percent are primarily using AWS," the report said. "Microsoft shows greater strength equally with developers who target large enterprises, and those who target small to medium businesses (14 percent each)," it continued. "They are weaker with those targeting consumers (11 percent) or professionals (9 percent). Google shows the opposite pattern being strongest with developers who target consumers (10 percent) but only half as popular with those who target large enterprises or internal employees." Both Microsoft and Google are helped in their challenge to AWS by their sheer size, generating profits that enable them to compete in the extremely expensive process of setting up global networks of datacenters and fiber to support operations, the report indicated. 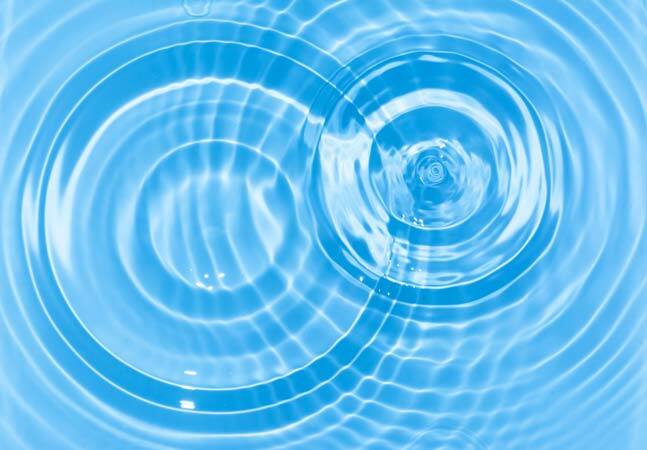 Company size on the other end is also important, as the report noted public cloud providers don't care much about attracting individual developers, with enterprise customers being the prized plum. "Taking the share of primary cloud host across both company sizes and target audiences into account, we predict that AWS will continue to outpace both Microsoft Azure and Google Cloud Platform, growing faster in absolute terms than both of them put together," the cloud section of the report concluded. "We also expect Microsoft's cloud business to grow faster (again in absolute terms) than Google's in the short term, as building trust with large enterprises and a reputation for serving them well is going to take several years, however good their technology," it continued. "That said, Google is increasingly well positioned to win business from the startups that target enterprises. As companies rush to enable mobile workflows some of these startups could grow spectacularly fast, giving Google a decent shot at second place in the cloud hosting market in the longer term." 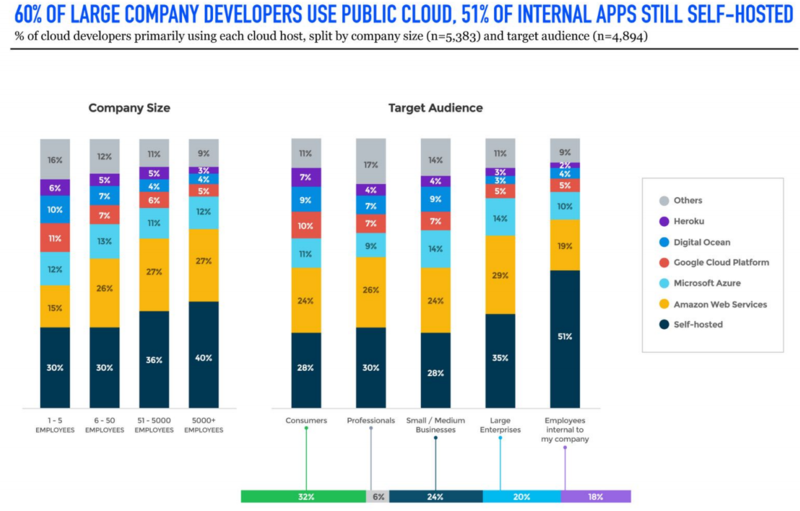 The emphasis on public cloud computing in the new VisionMobile survey -- warranting its own section -- shows how the space has grown in influence in a short period of time among developers. 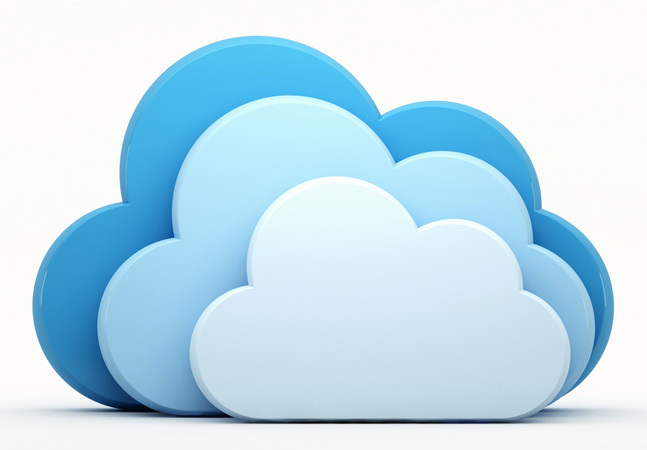 Take, for example, this quote from VisionMobile's Q3 2015 report: "Don't expect to see the clouds out in public. 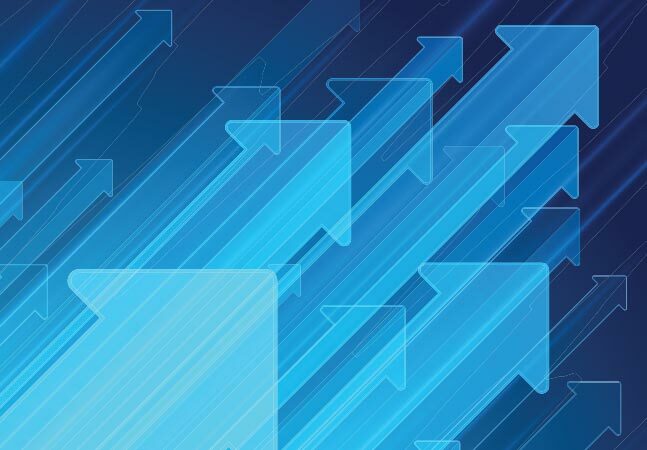 The most popular cloud development platform is decidedly private (targeted by 44 percent of developers), ahead of AWS (16 percent) and Microsoft Azure (13 percent)."